This article is about a town in Tamil Nadu. For the temples and monuments, see Group of Monuments at Mamallapuram. Mamallapuram or Seven Pagodas or Mahabalipuram, is a town in Kancheepuram district in the southeastern Indian state of Tamil Nadu. It is on the coastline 58 kilometres (36 mi) south of the city of Chennai. An ancient historic town and a bustling seaport in the 1st millennium CE, now a beachside tourism center with a group of Tamil monuments declared as UNESCO world heritage site, it is one of the most visited towns in South India. Mamallapuram was one of two major port cities by the 7th century within the Pallava kingdom. Along with economic prosperity, it became a center of a group of battle monuments carved out of rock. These are dated to the 7th and 8th centuries: rathas (temples in the form of chariots), mandapas (cave sanctuaries), giant open-air rock reliefs such as the famous Descent of the Ganges, and the Shore Temple dedicated to Shiva, Durga, Vishnu, Krishna and others. The contemporary town plan was established by the British Raj in 1827. Neolithic burial urn, cairn circles and jars with burials dating to the very dawn of the Christian era have been discovered near Mamallapuram. The Sangam age poem Perumpāṇāṟṟuppaṭai relates the rule of King Thondaiman Ilam Thiraiyar at Kanchipuram of the Tondai Nadu port Nirppeyyaru which scholars identify with the present-day Mamallapuram. Chinese coins and Roman coins of Theodosius I in the 4th century CE have been found at Mamallapuram revealing the port as an active hub of global trade in the late classical period. Two Pallava coins bearing legends read as Srihari and Srinidhi have been found at Mamallapuram. 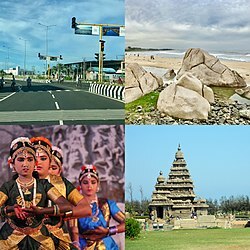 The Pallava kings ruled Mamallapuram from Kanchipuram; the capital of the Pallava dynasty from the 3rd century to 9th century CE, and used the port to launch trade and diplomatic missions to Sri Lanka and Southeast Asia. An 8th-century Tamil text written by Thirumangai Alvar described this place as Sea Mountain ‘where the ships rode at anchor bent to the point of breaking laden as they were with wealth, big trunked elephants and gems of nine varieties in heaps’. It is also known by several other names such as MAMALLAPATINAM and Mamallapuram. Another name by which Mamallapuram has been known to mariners, at least since Marco Polo’s time is "Seven Pagodas" alluding to the Seven Pagodas of Mamallapuram that stood on the shore, of which one, the Shore Temple, survives. The temples of Mamallapuram, portraying events described in the Mahabharata, were built largely during the reigns of Narasimhavarman and his successor Rajasimhavarman and show the movement from rock-cut architecture to structural building. The city of Mamallapuram was founded by the Pallava king Narasimhavarman I in the 7th century AD. The mandapa or pavilions and the rathas or shrines shaped as temple chariots are hewn from the granite rock face, while the famed Shore Temple, erected half a century later, is built from dressed stone. What makes Mamallapuram so culturally resonant are the influences it absorbs and disseminates. The Shore Temple includes many reliefs, including one 100 ft. long and 45 ft. high, carved out of granite. Mahabalipuram has a tropical wet and dry climate. The Köppen-Geiger climate classification is Aw. The average annual temperature is 28.4 °C. The temperatures are highest on average in May, at around 32.6 °C. In January, the average temperature is 24.3 °C, the lowest of the year. The average temperatures vary during the year by 8.3 °C. In a year, the average rainfall is 1219 mm. In winter, there is much less rainfall than in summer. The variation in the precipitation between the driest and wettest months is 309 mm. The town has a collection of 7th and 8th century religious monuments that has been declared as a UNESCO World Heritage site. 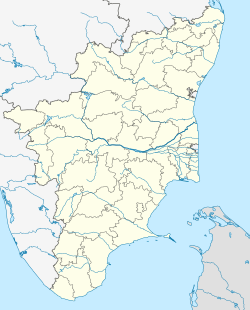 It is on the Coromandel Coast of the Bay of Bengal, about 60 kilometres (37 mi) south of Chennai, Tamil Nadu, India. The site has 40 ancient monuments and Hindu temples, including Descent of the Ganges or Arjuna's Penance – one of the largest open-air rock relief in the world. The site includes several categories of monuments: ratha temples with an architecture of monolith processional chariots built between 630 and 668 CE; the mandapa viharas with halls and stone roofs with narratives from the Mahabharata, Shaktism and Vaishnavism; rock reliefs particularly bas-reliefs of Shaivism, Shaktism and Vaishnavism; stone cut temples particularly those dedicated to Shiva that also reverentially display Vishnu and others, built between 695 and 722 CE; and, archaeological excavations with inscriptions some dated to 6th century and earlier. The cave temples and monolithic temples were built during the Pallava Period. The site is managed by the Archaeological Survey of India. Thirukadalmallai, the temple dedicated to Lord Vishnu. It was also built by Pallava King in order to safeguard the sculptures from the ocean. The Shore Temple – a structural temple along the Bay of Bengal with the entrance from the western side away from the sea. Recent excavations have revealed new structures here. Pancha Rathas (Five Chariots) – five monolithic pyramidal structures named after the Pandavas (Arjuna, Bhima, Yudhishtra, Nakula and Sahadeva) and Draupadi. An interesting aspect of the rathas is that, despite their sizes they are not assembled – each of these is carved from one single large piece of stone. The longest of these rathas is the Bhima ratha with a length of nearly 12.8 m and the tallest one is Yudhishtra ratha. As of 2001[update] India census, Mahabalipuram had a population of 12,345. Males constitute 52% of the population and females 48%. Mahabalipuram has an average literacy rate of 74%, higher than the national average of 73%: male literacy is 82%, and female literacy is 66%. In Mahabalipuram, 12% of the population is under 6 years of age. Lukas Hartmann: Mahabalipuram oder Als Schweizer in Indien. Ein Reisetagebuch. Arche, Zürich, ISBN 978-3-716-01764-7. ^ Kathiresan, Rajesh Kumar. "TN Motor Vehicle Registration". ^ a b c d James G. Lochtefeld (2002). The Illustrated Encyclopedia of Hinduism: A-M. The Rosen Publishing Group. p. 399. ISBN 978-0-8239-3179-8. ^ National Geographic (2008). Sacred Places of a Lifetime: 500 of the World's Most Peaceful and Powerful Destinations. National Geographic Society. p. 154. ISBN 978-1-4262-0336-7. ^ George Michell (1977). The Hindu Temple: An Introduction to Its Meaning and Forms. University of Chicago Press. pp. 131–134. ISBN 978-0-226-53230-1. ^ Kathiresan, Rajesh Kumar. "Pancha Rathas". ^ Kathiresan, Rajesh Kumar. "Light House". ^ "Census of towns in Tamil Nadu" (PDF). Census of India. Retrieved 10 June 2012. Ayyar, P. V. Jagadisa (1991), South Indian shrines: illustrated, New Delhi: Asian Educational Services, ISBN 81-206-0151-3 . Hurd, James (2010), Temples of Tamilnad, USA: Xilbris Corporation, ISBN 978-1-4134-3843-7 . Wikimedia Commons has media related to Mahabalipuram.